Sascha Glasl is a co-founder of the groundbreaking Amsterdam architectural practice, Space&Matter. At this free lecture Glasl will introduce their trans-disciplinary approach, melding the remit of urbanism, social media and architecture to explore new ways for design to add value and allow us to connect. Glasl will address the effect of innovative and sustainable architectural projects and interventions on the broader scale of precinct and zone transition. He will explain how the language of urban prototyping has influenced the studio’s work, and will outline the community-focused character of their projects. In 2009 Sascha Glasl co-founded space&matter together with Tjeerd Haccou and Martijn Pool. Space&matter work within the fields of architecture, urban planning and concept development. From 2010 to 2014 Glasl was a Professor’s Assistant at RWTH Aachen University, Department of Building Typologies and Design. 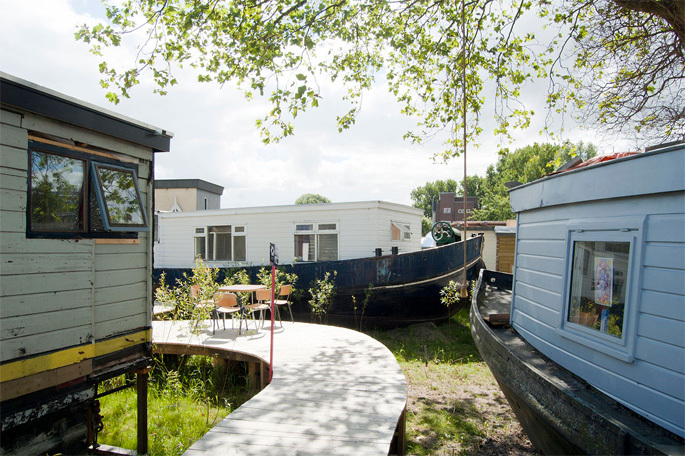 He more recently spearheaded the De Ceuvel project in Amsterdam, where a post-industrial land and discarded houseboats were transformed into a creative eco-hub. This lecture is presented by the Victorian Eco-Innovation Lab (VEIL) and is supported by the Embassy of the Kingdom of the Netherlands in Canberra.